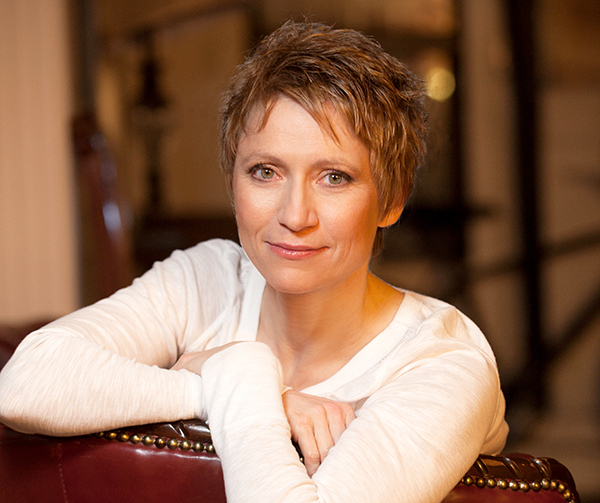 Kathleen Rea is a dancer, improviser, choreographer and activist in Toronto, Canada. 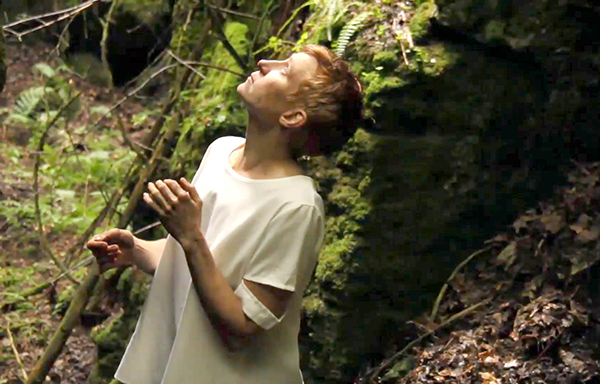 In 2000, she formed REAson d’etre dance productions, a dance company that promotes contact dance improvisation. Through her company, she has produced the Wednesday Dance Jam, the Contact Dance International Film Festival and the Moved By Natural Forces Retreat. After publishing guidelines clarifying appropriate and inappropriate behavior for the Toronto Wednesday Contact Jam, she received a spectrum of praise, harassment and critique. Then, this past year, Kathleen distributed a petition calling on Les Grands Ballet to hire a female choreographer after the company hired three male choreographers for a program entitled “Femmes.” Kathleen’s petition garnered much attention, making her an advocate for women in dance and forcing her to reconsider her own history and trajectory. Can you tell me a little about your dance history and how you came to be passionate about contact improvisation? I trained as a ballerina at the National Ballet School of Canada from the age of 10. I was a free-spirited dancer trying to fit into a precise mold. It seemed that I could never quite get my body or spirit to conform. I loved to dance but I was in a battle between myself and my art form. I discovered contact improvisation towards the end of my ballet career, and it felt like I had come home. I was living in Innsbruck, Austria working for the Tiroler Landestheater. I had this group of non-dancer friends who were always going off and doing this weird thing called contact improv, and they would frequently try to get me to come. They kept saying it would be good for me. I told them, “No thank you.” One day they said they were going to a contact workshop in the mountains, there was an extra spot in their car, and I could hike if I didn’t like it. I climbed in the car and an hour later I was doing contact improvisation. I had a “sky-opening-angels-singing” epiphany that I would do this for the rest of my life, and that is what I’ve done. With contact improv I can make choices. I don’t have to fit my body into a predetermined form. I love the expressive potential and how stories spontaneously emerge in a dance. Growing up, I sat in the wings mesmerized by classical story ballets. In my choreography career, I morphed my two loves – story ballets and contact improv – into a kind of dance theater where there’s a plot, characters and script, and most of the story is told through contact improvisation scores. When I left company work, I missed having a group of people to dance with on a regular basis. They had been my family. I started the Toronto Wednesday Contact Jam 19 years ago so that I would have a community to dance with again. There came a point when my body gave out and I was in pain every moment of the day. Dancing a 30-hour work week for so many years had worn away all the cartilage in my knees. I was heading towards a knee replacement until I discovered the Axis Syllabus. The Axis Syllabus is a collection of functional movement concepts that are safe and energy conservative and work in relationship with anatomical structure. I became a candidate teacher and started the process of working with my body instead of against it. 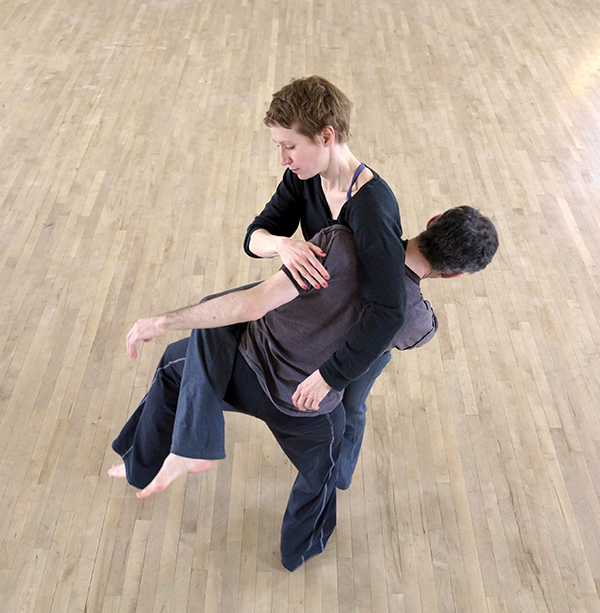 I now practice and teach contact improvisation through the lens of the Axis Syllabus. I am fast approaching 50 and I am just reaching the top of my form in terms of quality of movement, strength and artistic expression. If you had told me when I was 15 that I would be at my peak some 35 years later, I would have thought you were joking. Why did you start writing about dance? Some people debated with me, trying to convince me I was going in the wrong direction. Others were more aggressive and scared me with bullying type behaviors online and in person. After these experiences, I would just get on my computer and start writing out my thoughts to organize and prepare myself to defend against attack. I self-identify as having high functioning autism and one of my spectrum characteristics is being able to sift through details and organize them and to repeat this process for months and years until a crystalized idea emerges. I did all this for myself but then realized it was also relevant for others. I started the Contact Improv Consent Culture Blog a year ago to publish some of my work. I had been blogging already on various subjects such as parenting, cooking, health and expressive arts for 10 years. I did it just for fun and no more than 40 or so people would read my posts. I had no reason to believe the Consent Culture blog would be any different. But with my first “That Lady” post, in which I described the push back I had received about my jam guidelines, my year of accidental activism started. I say “accidental” because I had no idea what was coming when I clicked “publish.” My “That Lady” post was read by 35,000 people in a few weeks. Messages started pouring in from all over the world. A few were vehemently against my viewpoint, but most were stories of abuse people had faced in social dance settings. Why did you feel the need to put together guidelines outlining boundaries for what is appropriate in a contact jam? Was there one incident, or did the need grow over time? My first day doing contact improv, the teacher took advantage of my blissed-out epiphany state and his position of power in relation to me being a newcomer. He added in a few other predator techniques to sway his position of power over me in his favor and made advances on me. The “whisper chain” reached me a day late. Whisper chains occur when the only prevention against harassment is a whispered warning from one woman’s ear to the next. I was warned that he was a teacher well known for this behavior after something had already happened. I will always have my first epiphany in contact dance intertwined with this memory. As I became more contact dance savvy, I wanted a space to dance where I didn’t have to defend against sexual harassment. In private conversation, many women talked about the pass-by-pokes, tickles and massages in which someone would come up to them from behind. One woman said “Yes, I can defend my boundaries, but I get tired doing so… I just want to dance.” And so I began to craft guidelines that taught people a general understanding of consent to help address this issue and many other issues happening at the jam. How have your guidelines generally been received? When I first wrote them almost 20 years ago, people thought I was crazy. Then there started to be a slow growing understanding of consent issues and systemic sexism. When the #metoo movement hit, there was a wave of understanding as to why I had written them. In the first decade of the Toronto Wednesday Jam, several women approached me with a thank you, and we would exchange a silent and knowing nod that spoke a hundred words. Back then, the community of women, myself included, were not talking publicly about boundary issues. It was all conversations in private. We did not have language yet to address, describe, or even to understand the issues. For example, I felt so icky every time I thought about my first contact teacher, but I did not have words to describe what had happened, or even an understanding of how he took advantage of me, until almost 10 years later. Many years ago, my guidelines were put in a compendium of other guidelines and started triggering a lot of conversation and push back. I became “that lady” who made those guidelines. When I realized the attention my guidelines were receiving, it became even more important for me to sift through them carefully. Even today, I make changes to them every few months. They are really a 19-year project at this point. Now there’s a front page in which I explain that I believe diversity in types of jams benefits community and that each jam can have its own mandate and ways to support it. In terms of building consent-based jam communities, providing guidelines is just one method. You also can offer training that builds capacity, education so people understand consent better, or lead through principles. My very specific guidelines are just one way, and there’s space for other ways. I added a whole section on how to promote boundaries. When newcomers arrive, I refer to that page as I give them an introduction on the basics of boundary setting within the dance form, such as how to redirect or end dances. I also educate people about the power imbalance between newcomer and advanced dancer that resolves after the newcomer has acclimatized themselves to the form. I think I have seen changes over the years. I used to see a lot of pass-by-pokes and tickles, or people starting dances by coming up from behind so the other person couldn’t see them. I hardly ever see these things anymore. Also, I think newcomers are going out onto the dance floor with a bit of know-how, and our community now understands taking advantage of their lack of knowledge is just not acceptable anymore. It is still a work in progress with lots of work ahead, but I have seen change. Earlier this year, you confronted Les Grands Ballets Canadiens about their programming of three male choreographers to create pieces on the topic of women. You garnered a couple thousand signatures on a petition in a few days and were able to meet with the artistic director and voice your protest. Although unable to convince him to hire a female choreographer, he did change the topic of the show. How has the episode affected your own work, either choreographically, via writing, or hosting the jam? Yes, that was the second half of my year of accidental activism. One night I was so mad about their programming choice that I went to change.org and within 15 minutes I had launched my petition. Really, I was expecting only about 100 people to sign it. I did it because I needed to do something with my anger. Once again, I clicked “publish” with no idea what would unfold next. Within a few days, the whole thing was blowing up and I was doing about four interviews a day. The Guardian picked up the story and it went international. It was a crazy ride that I was on while still managing family life. One time I was wiping my toddler’s bum and picked up the phone and it was a request for a live interview on CBC happening in the next 10 minutes. I was doing interviews while walking my kids to school, during nap time, while making lunches. People saw that I had the “stage” and I received secret coaching calls from both prominent and disempowered people in the ballet world who requested not to be named. “You have to say this in your next interview… “you need to bring up the race issues…” “this bit of info will help your argument.” I felt responsible to use my time in the limelight to get an important message across and to be the voice of many as best I could amidst the chaos of parenting! My kids ended up watching a lot of Netflix cartoons with headphones on that month as mommy was busy taking on the world. I also thought about my own history and my time at the National Ballet of Canada. I danced about 40 different ballets there, and only one was choreographed by a woman. That was the Nutcracker. And then a few years later, they rechoreographed their Nutcracker by a man. As an aspiring young female choreographer, my future looked bleak. When I met with Les Grands, I pointed out to Ivan [Ivan Cavallari is the company’s artistic director] that in the next season they had planned eight choreographies, and only one was by a woman. He told me I wasn’t counting correctly: “Giselle and Swan Lake are classics. Classics are always choreographed by men. That’s not our fault, so let’s take it off the count. Nutcracker, well it is just the Nutcracker so let’s take it off the count too. And Cathy Marston has an entire evening, so let’s count her as two.” Why would a woman count as two for having a whole program when so many times men receive whole programs? It should just be normal that women choreographers can get a whole evening. For most of my time speaking with him he was trying to convince me that he was not a sexist man and that he was the victim of the situation. He could not make the leap towards talking about systemic sexism and the role we each play within the system. From your perspective, is the sexual abuse your contact improv guidelines seek to protect against and the incident with Les Grands Ballets part of the same patriarchal patterning? Do you feel like conditions for women to make work/take on leadership/have a strong voice in dance are getting better with time, or staying the same? The alleged stories of sexual harassment and abuse that have recently come out are quite horrific – Royal Winnipeg Ballet, New York City Ballet. I think in many ways there has not been change but at least the conversation has started spurred on by the #metoo movement and by brave women coming forward. When I was recovering from an eating disorder, I told the National Ballet I wouldn’t be at my performance weight for a couple of months, so they fired me. I was literally told, “You’re too fat, so we’re firing you.” Nowadays, it’s not as overt. They do not dare say that so openly anymore because there have been too many court cases. Thing are more sugarcoated now. As always, there are pioneers. At Canada’s Ballet Jörgen, the dancers have more diverse body shapes and are not pressured to be thin. Since their inception, they have also hired 50 percent female choreographers and not because they were trying to hit any target. They just did it without even realizing they were doing it. I teach at Ballet Jörgen School and all faculty are banned from starting conversations about students’ weight. It’s just a no-go topic. There are also ballet dancers like Misty Copland who are paving the way for change with a muscular physique. She is a picture of strength that is an empowering role model for young girls. Simone Orlando, the artistic director of Ballet Kelowna, recently did a program of all female choreographers. There are many pioneers out there making a difference. In terms of looking at numbers, I would say both the contact improv world and the ballet world are skewed toward male power. While there are many women in low paying or volunteer positions, the list of headliner male teachers/choreographers is extensive in both scenes when compared to the female count. So many female choreographers have had to go out and make their own careers, myself included. The commissions are not coming in, so we start our own companies. We fundraise. We make the work happen. There is a lot of female talent out there crafted through sheer willpower to keep going despite the challenges. Can you tell me a little about the Contact Dance International Film Festival? What was the impetus for it, and how has it gone thus far? One of the reasons I started it was because I was starting to feel disempowered being an aging woman in the youth orientated dance world. I wanted to do something that gave back and would at the same time empower me, something that I could do regardless of the amount of cartilage left in my knees or how old I got. There wasn’t a contact dance film festival, and I was always finding amazing contact dance films online and wishing there was a way to screen them. We’re going into our fourth season this spring, and it runs every two years. Usually we get over 100 films submitted, and we are able to screen about 40 of them. There are also workshops, jams, receptions and an award ceremony. In keeping with the all-levels approach in contact improvisation, we welcome submissions of all levels. It could be filmed on a cellphone at a jam late at night and if it’s something that shows a beautiful relationship we’ll program it. We’ve had both student projects and professional films with amazing cinematography programmed right after one another. This next year, we’re bringing in Tiina Jääskö as our headline teacher. You mentioned to me your reach (in terms of audience/readership) has grown immensely due to the events of this past year. Has it changed your approach to your writing or choreography? I got so involved and pulled into my year of accidental activism – answering emails, doing interviews, writing – that I lost the thread of my paid work. My earnings went down significantly, and this affected my family. By the end of the year we were struggling with the bills. Yet, I was called upon to do this important volunteer work. I had a platform, people were listening, and I felt a deep responsibility to give voice to many who had been silenced. It was tiring, and I had to come to terms with my own ballet career and the lack of work I’ve gotten as a choreographer, as well as the level of sexual harassment in the contact world. There were moments when I felt that I did not have the strength for this activist role. I did not feel brave. Yet there I was, being brave anyway. There was a cost both financially and emotionally. I entered a deep state of grieving. I was being called upon to face what I had faced as a young female dancer, to deeply feel the pain of it and the pain of others who had faced similar things. I really could no longer pretend that things were okay. And there is much self-work and world-work in that realization. Yes, in Toronto, after the #metoo movement hit, many men were feeling too scared to attend jams. Women had come to jams for years and practiced navigating contact improv with a certain level of fear and lack of safety. Much practice made us pretty good at the task. For many men, managing chronic fear at a jam was new for them. I realized the men needed support. So, this past year, I organized men’s circles in our contact dance community. They were a place for men to talk and figure their way through. Also, there has been a shift in our Toronto Community. It used to be that to be banned, one’s behaviors had to be extreme and be repeated even after a warning. Many of us realized that when we ban someone without any attempt to educate them, they are likely to just find a new community and repeat their pattern. In Toronto, we now make every effort to have “calling-ins,” in which we seek to enter conversation and to educate. If this process does not work, we move to a ban. We also realized that there is a whole spectrum of issues and some are milder than others. An example would be a person who is generally respectful of boundaries but has a habit of starting dances in a way that the person can’t see who they are. I might sit down with them on the context of being a jam facilitator and say, “Look, unless you are at a blindfold jam, in general it is best practice to invite a dance in a way that the person can see who you are.” I explain that “best practice” means we aim for that and understand it will not be perfect. This is an example of a “light” consent conversation. I offer that we can start having conversations about consent all the time and not save these conversations for extreme cases, that conversations about consent become the new normal.